a Scan4Safety Demonstrator Site. Scan4Safety is a pioneering programme led by the Department of Health that is improving patient safety, increasing clinical productivity and driving operational efficiency in the NHS. Scan4Safety is taking the learnings from other sectors, such as retail, to improve traceability and efficiency in the NHS through the use of international barcoding standards (GS1 standards) and common ways of doing business (PEPPOL). Through Scan4Safety, Salisbury NHS Foundation Trust has improved operational efficiency and saved £685,943 in pharmacy. Salisbury NHS Foundation Trust’s pharmacy department operated many stock management processes manually, for example manual catalogue management processes, invoice processing, and expiry management. Many of these processes were both time-consuming and prone to human error. As the NHS faces the challenge of increased demand and financial pressures, it must continue to deliver an ambitious and modern healthcare service. Improvements in efficiency and automation are key to achieving this. To implement a catalogue management system in order to improve the ordering process and contract management. To enable electronic invoicing in order to improve efficiencies. To improve inventory management, through the implementation of GS1 barcoding standards and the accurate capture of product information, enabling better tracking of products. The Trust’s purchase-to-pay (P2P) process for pharmacy was reviewed by a P2P group whose members included the Deputy Director of Finance, Financial Controller, Financial Accountant, Accounts Payable Section Head, Scan4Safety P2P Use Case Lead, and Scan4Safety Pharmacy Lead. As a result, a new catalogue management system as well as an electronic trading and invoicing process, were introduced. Releasing time – Through simple changes in practice, the administrative duties of a ‘Band Six’ Pharmacy Procurement Lead/Stores Manager has reduced by eight hours per month. Improving efficiencies – The number of electronic invoices transacted have increased from an average of 44% to 63% (April – July 2017). Reducing wastage – Through the use of 2D barcodes, expiry dates are automatically recorded. Staff can quickly run reports to track available stock, short-life stock and products that are close to expiring. This visibility enables the use of products that are close to their expiry dates, reducing waste. Furthermore, this automatic report is saving staff time. Previously, a ‘Band Three’ staff member would spend half a day per month manually checking the robot for expired and close to expired products. This has now been reduced to two hours per month. Redeployment of products – From April 2016 to July 2017, drugs and products worth £356,647 were rotated to other departments, providing significant cost savings though the redistribution of stock. Reducing stock – By simply reducing the stock holding days of manufacturers, wholesalers and pharmacy technology services, the Trust saved £329,926 in 2016/17. This represents a stock reduction of 23%. 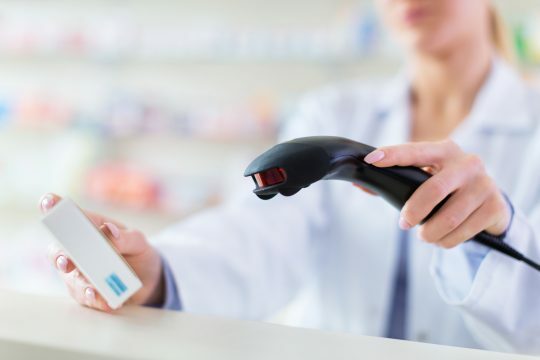 Through simple changes to existing processes and improved automation, significant cost and time savings for the pharmacy department have been achieved.